Kollmorgen Automation Suite™ dramatically shortens development time for complex, multi-axis motion while increasing machine throughput by 25 percent or more. Choose standard IEC 61131 programming, or use Kollmorgen’s exclusive Pipe Network™ to quickly create a drag-and-drop representation of your machine and automatically generate error-free code. Either way, Kollmorgen Automation Suite™ makes it simple to create PLC and motion programs, cam profiles, device setups, I/O specifications, HMI interactions and more – all through a fully integrated graphical interface. Simplify things even more by eliminating excess hardware from your machine. 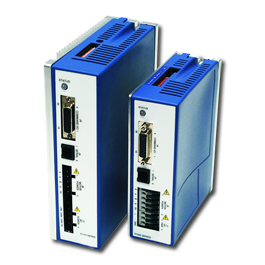 For example, our AKD PDMM® drive incorporates Kollmorgen Automation Suite™ master control for up to seven additional AKD™ axes, with no need for a separate controller. Our Cartridge DDR® servo motor mounts directly to the machine with a few bolts, eliminating the need for gears, belts and other maintenance-intensive, backlash-prone transmission components. And our microstepping technology lets you use cost-effective stepper motors and drives in applications that might otherwise require a full servo motor, drive and feedback system. A simpler machine is more adaptable, easier to change over, easier to maintain and repair, and lets you do more with less: Less development time, less cost, less room for error.